Three more days until the Edible Book Festival! Starting at 4pm - Marvel at the smorgasbord of scrumptious volumes and vote for your favorites! Have you entered your "treat"ise into the contest yet? Enter here! Starting at 4:30pm - Enjoy refreshments while the artists speak about their work! After the votes are tallied, we'll all eat their work too! At any time during the event, from 4pm-6pm, visit a craft table to make your own edible creations! Are you crafty, and do you enjoy helping others? We could still use a few volunteers to assist at the craft tables and help with event clean up. If you are interested in lending a hand, please contact Valeria Kremser (and THANKS, in advance)! 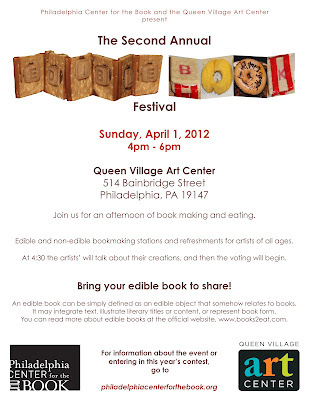 Philadelphia Center for the Book and the Queen Village Art Center are happy to announce the Second Annual Edible Book Festival! of eating your own words. Join us for refreshments, crafts, and, of course, edible books. Vote for your favorite and then eat it! Artists’ talks will take place at 4:30 and, while the votes are being tallied, the eating of the books will begin. to download an entry form. calligraphy to Portland in June 2012.